HyTech designs and manufactures many types and styles of collectors. All collectors can be constructed from many different converging angles and radius’s bends. 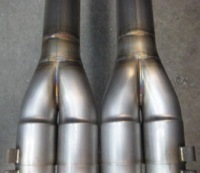 This allows HyTech to custom tune your exhaust system for its specific requirements. The collectors are one of the biggest areas where power and acceleration can be found. Each engine requires something different for collector type to extract the maximum potential of the engine. HyTech introduced the Nozzel Merge Collector, a State of the Art Design that was designed with CFD Technology (Computational Fluid Dynamics). 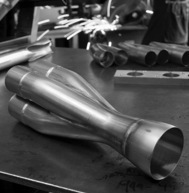 This radical new design has transformed the way we design and manufacture our exhaust systems. There is a patent pending on this style of collector. And they can be made in any configuration from 2 into 1’s to 6 into 1’s.